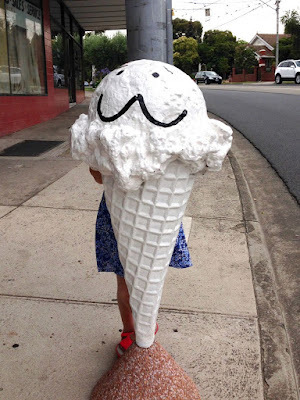 We have often driven past Minot Gelato with its white ice cream cone sign out the front and I have promised Sylvia we will go there one day. 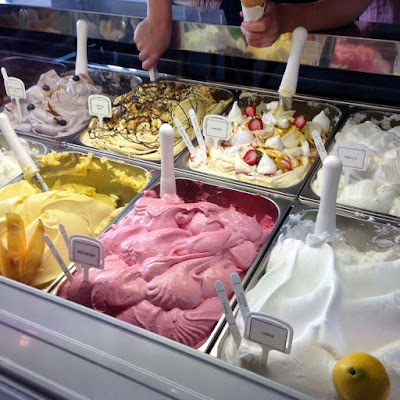 So on a stinking hot day before Christmas when we were passing by and in need of cheering up, we headed there for a gelato. I am pleased to say it was worth the wait. Others have raved about Minot Gelato and with good cause. 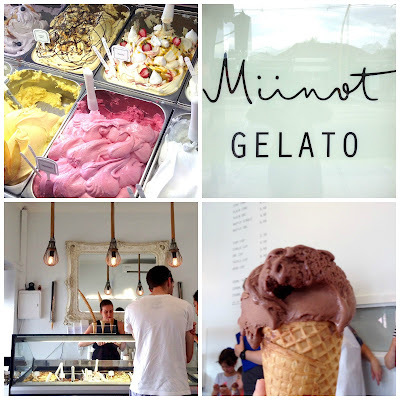 Inside, the small shop is clean and white shop with a large gilt mirror behind the counter and colourful gelati in the glass display cabinet. There is a wooden bench for the lucky few to sit on. Others mill about enjoying their ice creams. And if you are particularly messy there is a sink where you can have a wash.
Sylvia chose a raspberry (vegan), E chose a blueberry salted lavender, and I chose a chocolate. I really wanted the vegan chocolate which was wickedly dark but it had coffee in it which I don't like. 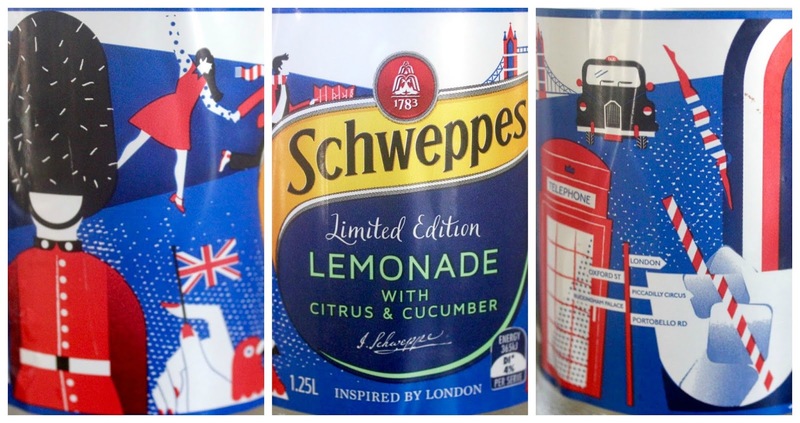 The flavours change every day. 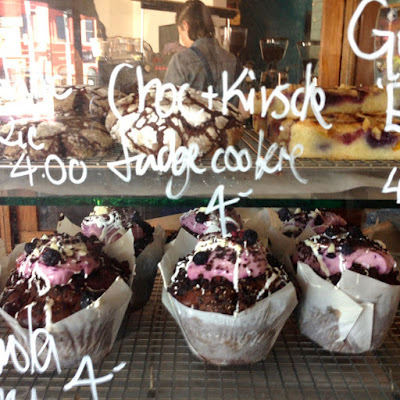 Which means we might not have a chance to return and try out the impressive looking pavlova or the honeycomb. 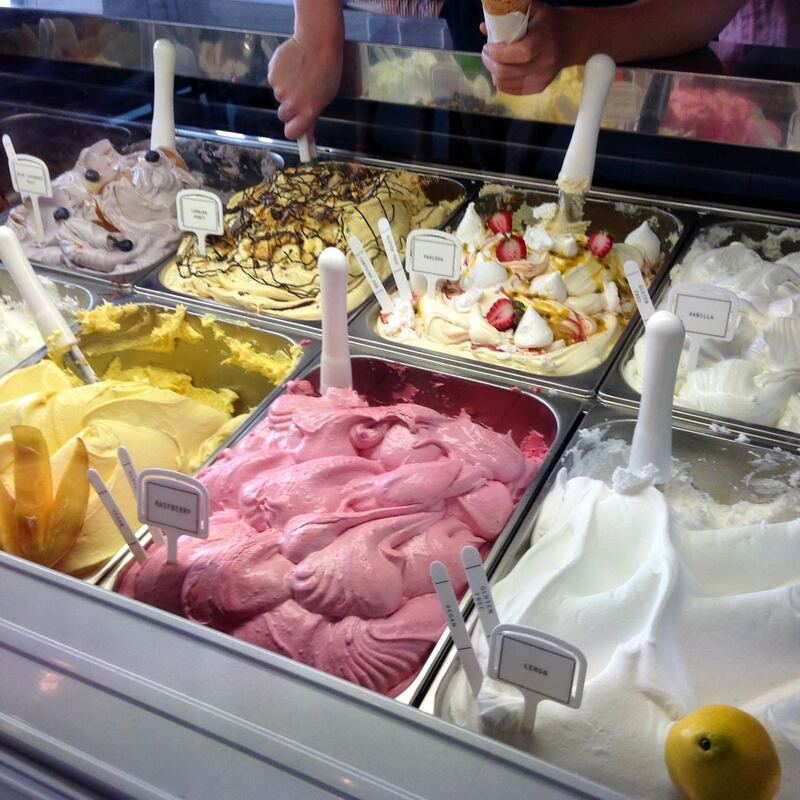 Vegan and gluten free gelati are clearly marked. The chocolate was really creamy with loads of flavour. I was not sure if I preferred it or Sylvia's amazing fruity raspberry. Unlike most berry ice creams that she eats, this one tasted like it was full of fruit and was quite refreshing. I found it hard to taste the subtlety of E's ice cream after my chocolate. 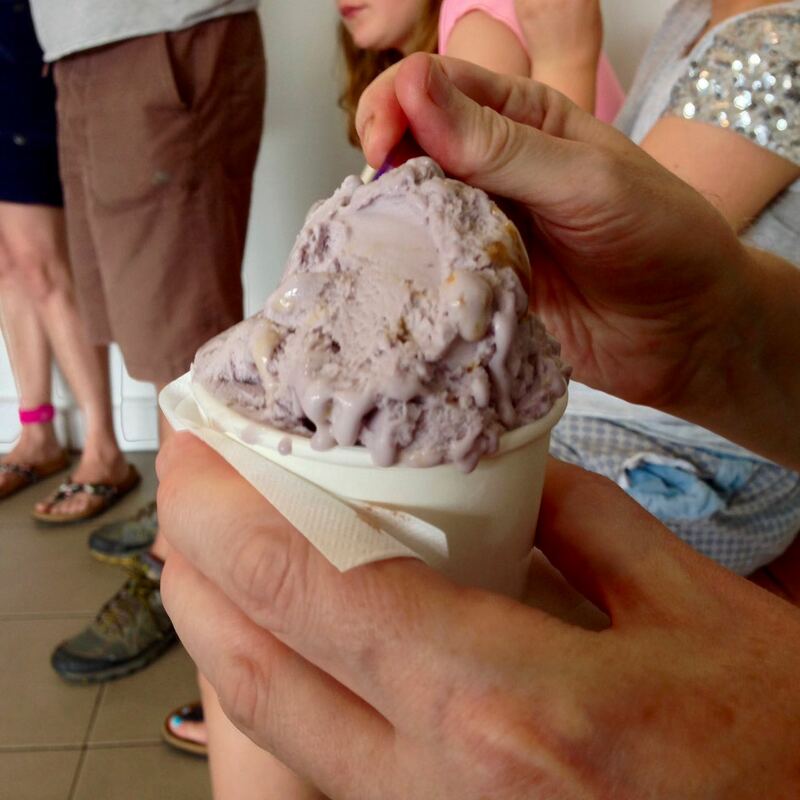 He had a blueberry lavender ice cream with salted caramel sauce and was very impressed. On the way out, Sylvia enjoyed being up close with the ice cream sign. And by then we were relieved that the cool change was on its way. Given that New Year's Eve tomorrow is forecast to be 39 C, I would highly recommend you head there but it is closed until 2 January. After that I am sure we will be returning. We went to Naughty Boy in North Carlton today because Sylvia and I were so tempted by a photo in an online list of amazing milkshakes. 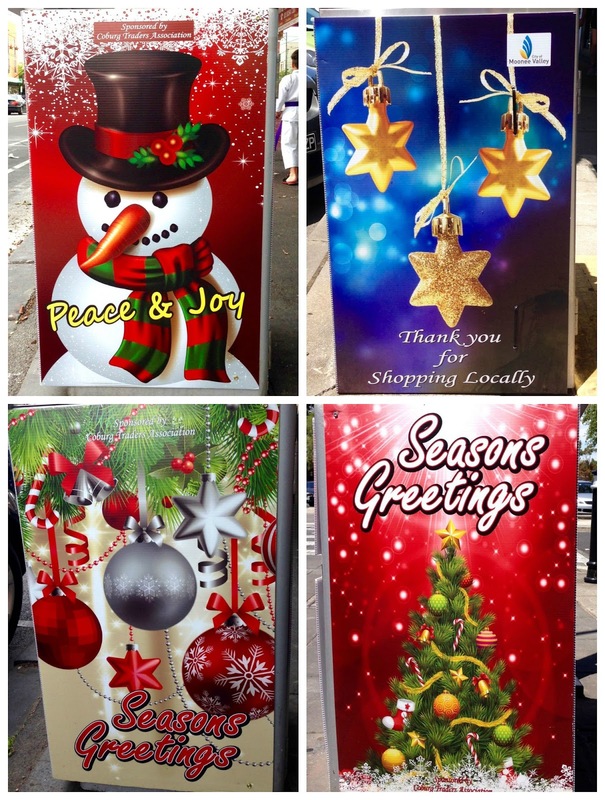 They looked so beautiful and were available on our side of town. First, we headed to Readings Bookstore in Carlton for bargain price calendars for 2016. I was tempted by this Very Veggie Family Cookbook because it has some really lovely simple recipes. Then we went to Naughty Boy filled with Great Expectations. 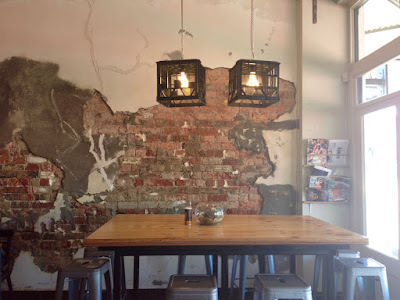 The design was very stylish with the exposed brick walls, the giant face peeping over the tables and the pressed metal around the counter. This cafe is built for the hipster crowd. And they come. Don't be fooled by this quick picture I snapped. It wasn't hard to get a seat but the place was really full and tables were not vacant for long. Sylvia and I looked about while we waited for our milkshake. The muffins and slices in the display cabinet looked really good. Soon our milkshakes arrived. 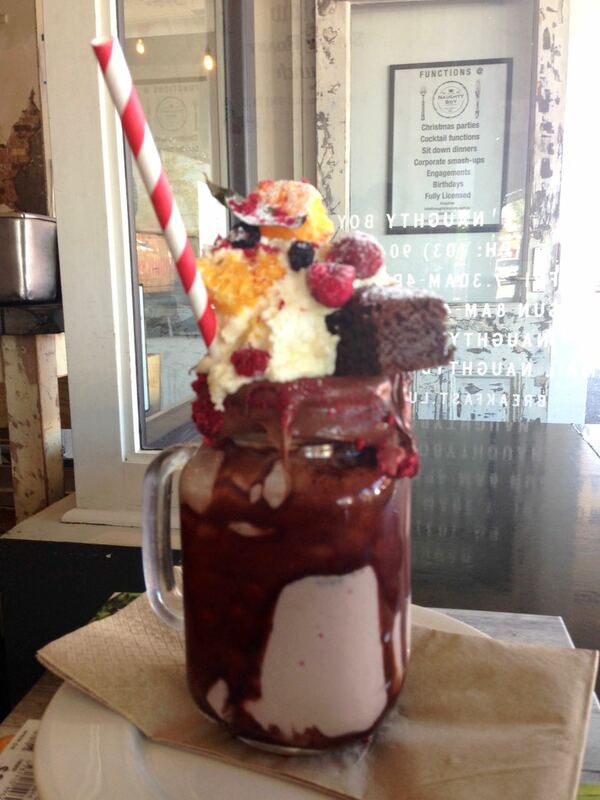 I am not usually a milkshake fan but when it comes topped with a brownie I can be swayed. Mine was the Chocolate and Nutella Fudge Milkshake. 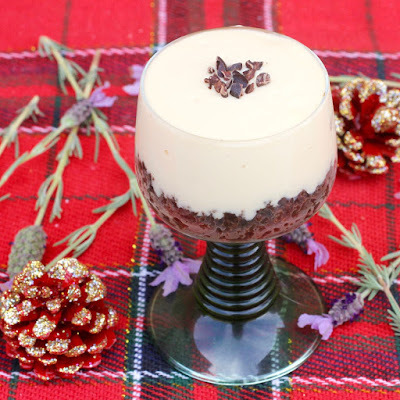 It was topped with a gluten free brownie, freeze dried fruit and what I thought was cream (though when I looked up an online menu it says white chocolate mousse and now I am unsure and cursing that I did not take a photo of the menu). The brownie was very impressively fudgy. Sylvia and I loved the nutella around the edge of the jar and we both loved the chocolatey creamy milkshake. 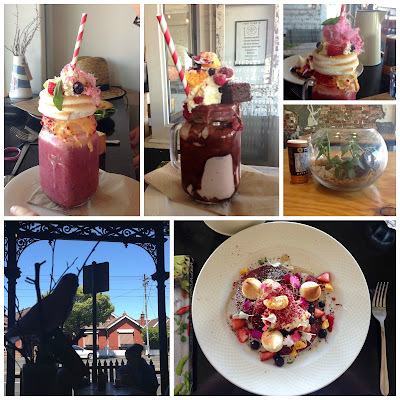 Sylvia chose the Pavlova Milkshake. 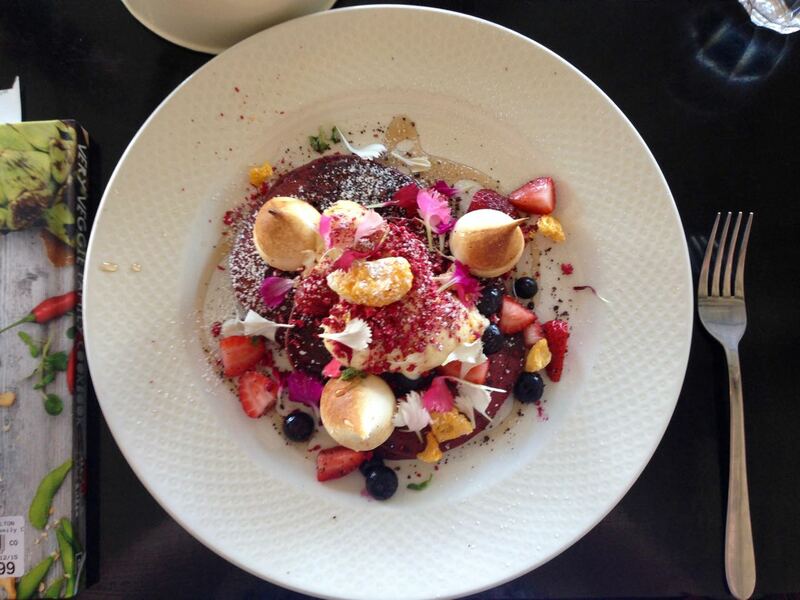 This was coconut milk, vanilla and lime, passionfruit curd, meringue, kiwi fruit, mixed berries and strawberry fairy floss. I could not get a decent photo of it when it arrived as Sylvia just wanted to dive into the fairy floss (and the light wasn't great in our window seat). The cream and curd proved a bigger challenge for her. She was less keen on the actually milk shake which was really fruity but decided that the meringue was really good when dipped into the fruity drink. The other milkshake was the Salted Caramel with nutella, sticky date and rice pudding, peanut brittle and butterscotch cream. It sounded just as over the top as the ones we had but Sylvia cannot eat peanuts so we passed over it. I had really wanted to order the Spring Greens with pumpkin hummus, nuts and grains. It just wasn't Sylvia's sort of thing and I thought it best to go halves with her, given that we were having indulgent milkshakes. So we shared the Red Velvet Pancakes. This was a veritable forest of delight. The red velvet pancakes were served with fresh berries, vanilla marscapone, chocolate soil, freeze dried mandarin, citrus powder and burnt meringues. Yep, they don't do simple at Naughty Boy. I didn't notice the chocolate soil but I did appreciated the flowers ("what are these?" asked Sylvia in surprise) and the drizzle of maple syrup. This dish was heavenly. Everything worked together really well. 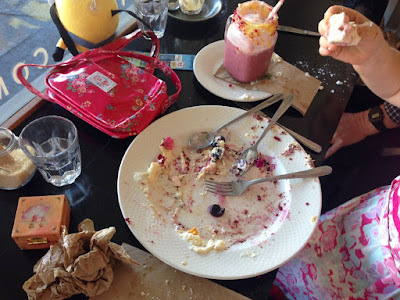 Unless you are a small child who is not keen on creamy toppings or mixing lots of unsual textures. Yet even Sylvia conceded that the pancakes were very good. E was a bit less flamboyant in his choices. He had a latte with a BRAT pide. (That is a bacon, roquette, smashed avocado, tomato and garlic aioli.) He sang its praises, saying that the avocado was good quality. His only complaint about the place was that it had too many hard surfaces that made the place noisy. Mind you, he says this about a lot of cafes. By the end of the meal Sylvia was squeezing the juice of blueberries into her mouth and giggling hysterically as it dribbled down her chin. Our table was a total mess. Like we had just indulged in a Baccanalian feast. I felt the need to apologise to the waiter as we left. Then we went home to eat salad for dinner! Sylvia is already planning to return for another milkshake. On Christmas Eve, Sylvia and I sat eating breakfast in the kitchen. Suddenly there was the sound of glass breaking. We stared at each other and then in the direction of the noise. Huh! Broken glass has been flung across the kitchen as one of my favourite goblets self-exploded. It was really weird. The only explanation I can think of is that we had used it for a caramel chocolate cheesecake only days before and it had exploded with happiness. The cheesecake was that good! Over a month before, we had lunched with my family before my mum had left to visit my sister in Ireland. She had made a family favourite, caramel tart. When I left she gave me the remains of the caramel that she had made by boiling cans of condensed milk. It wasn't until after she had returned that I finally used them. The caramel has lasted well in a jar in the fridge with only a few crystals forming. I don't make dessert often. The occasion for the cheesecakes was that we were going to see the Christmas lights last week. It meant that Sylvia was going to stay up much later than usual while we waited for darkness to fall. So we had far longer for dinner than usual. I didn't want a large rich cheesecake. 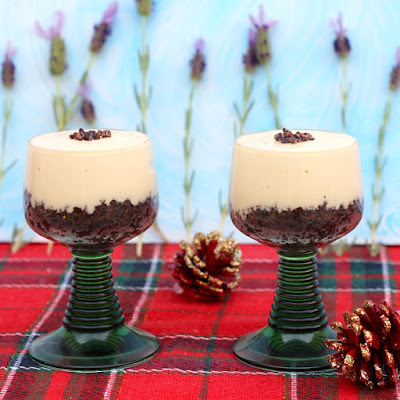 The idea that seems popular lately is to serve cheesecakes in little glasses so no baking or setting is required. My beautiful op shop goblets are just the right size for such desserts. (Sob! Now I only have 3 after the glass explosion). I had a brilliant idea of topping the cheesecakes with fudge chunks. Luckily Sylvia reminded me that I had used them in choc chip cookies weeks ago. Instead I used cacao nibs but Sylvia wanted choc chips which looks far less elegant. We all loved the cheesecakes. It was very rich in a very good way. Caramel and cream cheese work well together. It a marriage of the unbearably sweet with mildly creamy cultured cheese. I perhaps could have done with less biscuit base but no complaints. Chocolate and caramel is such a brilliant pairing. Sylvia only ate half of hers because it was too rich but she was very protective of her other half cheesecake. I highly recommend these cheesecakes as an impressive dinner party dessert. It is quite simple to put together and can be made ahead of time. But I must warn you that you might wish you had just kept them all for yourself. And if it is so good that your glasses spontaneously explode, don't say I didn't warn you! I am sending this post to Jen who is hosting Elizabeth's No Waste Food Challenge this month. Grind biscuits to crumbs in a food processor. Melt butter and stir in biscuit crumbs. Divide among four small glasses and press down firmly (I used the end of my wooden citrus juicer). Set aside. Beat together the cream cheese and caramel sauce. 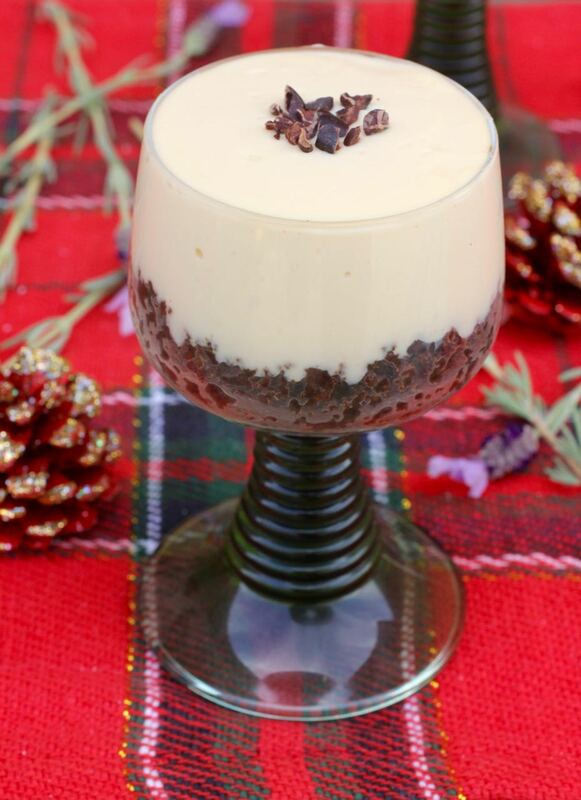 Spoon into prepared glasses on top of the biscuit base. I used the back of a knife to smooth mine across the top of the glass. Sprinkle cacao nibs, choc chips or fudge chunks for garnish. Can be made a day ahead and kept in fridge. Best served chilled. 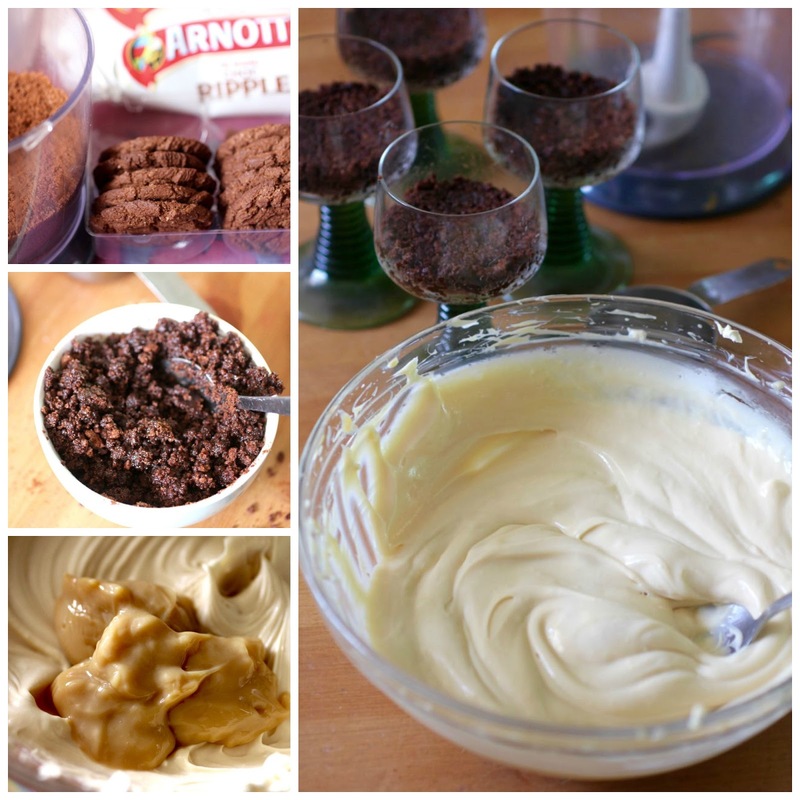 NOTES: Other biscuits or cookies can be substituted for the chocolate ripple biscuits. Oreos might work well here but require less butter. The caramel sauce I used was quite thick. It was made by boiling condensed milk. You could also use dulce de leche, caramel top 'n' fill or your own caramel sauce. Christmas day is over for another year. Today we are relaxing after the merriment and mayhem. Which means I have time to sort some photos and share them with you. 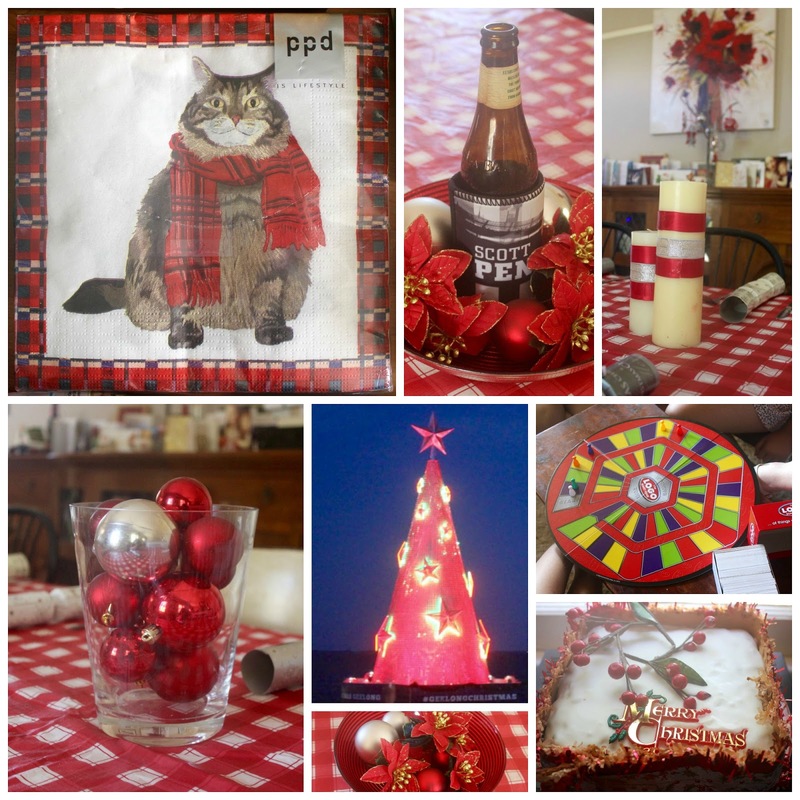 Christmas eve was a day of baking and last minute present wrapping. 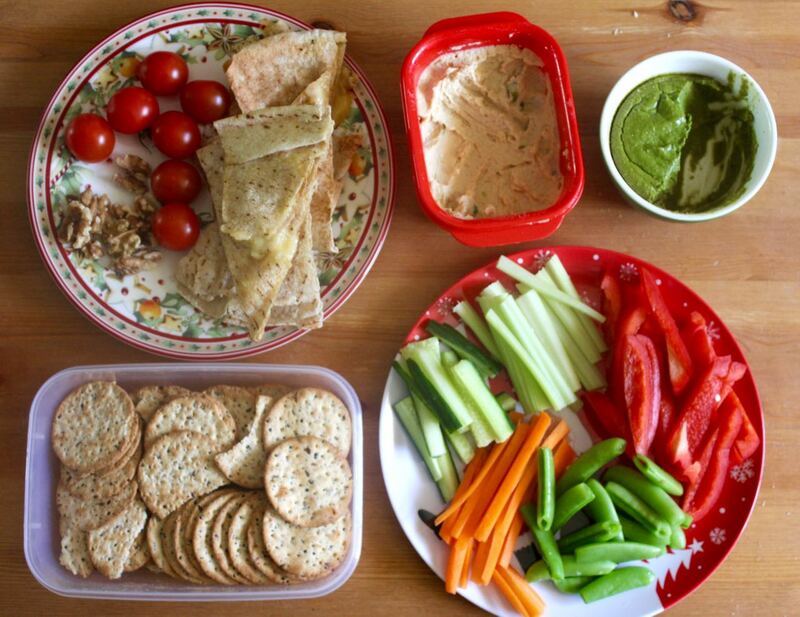 In the evening we had a simple supper of dips, bikkies, crudites, bikkies and pitas with melted cheese. 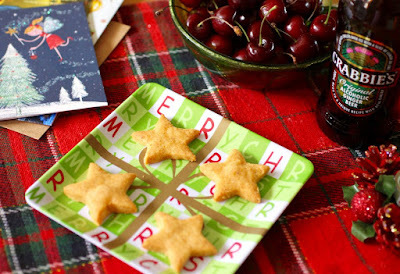 Christmas morning we opened presents, shared a breakfast of cranberry nut rolls, Jarlsberg cheese and orange juice. Then we drove to Geelong for the mayhem of opening presents at my parents' house. Then it was time to play a round of Logo board game and set the table. We ate a hearty roast dinner for lunch. 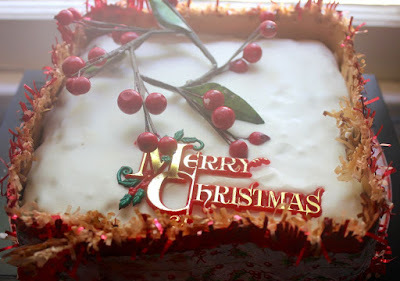 I made my annual Christmas nut roast. It was served with roast potatoes, pumpkin and carrots, peas, cauliflower cheese and cranberry sauce. So good! My mum made plum pudding with custard for dessert. We also had pavlova and chocolate cheesecake. There were bottle of drink on offer but I was most intrigued by this limited edition Lemonade with citrus and cucumber! It was rather nice, old chap. 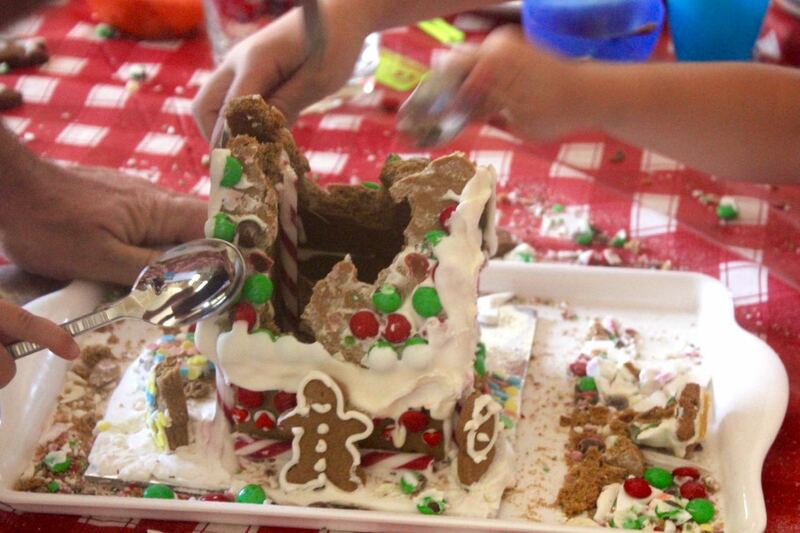 A stray ant or two drooling over the gingerbread house made it urgent that we pound the life out of it. Well I thought someone might break a hole in it with a spoon but it really was reduced to smithereens. My dad even thought it needed a mallet from the tool cupboard. The afternoon was spent trying to read my book and keep cool indoors while it was like an oven outside. 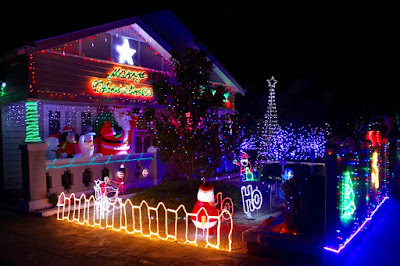 [We heard the news reports of fires down the Great Ocean Road and knew we were lucky to be celebrating Christmas in our homes.] The evening was a simple matter of leftover nut roast and the royal variety show. 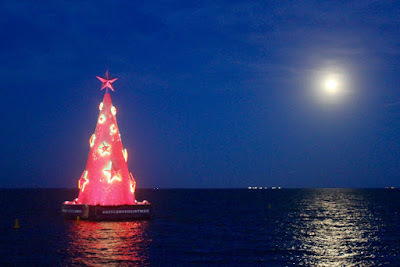 When the evening got dark we headed into Geelong city to see the floating Christmas tree and the light show on the town hall. Boxing Day was lots more good food (mmm salads, panforte, caramel tart) and family visits. We didn't spend quite as long with family as we had intended because E and I had booked to go to see the new Star Wars movie. The film was fantastic fun with lots of nostalgia, action, suspense, good versus bad and such a cute wee droid. We were given lots of lovely presents. Here is a selection. Lots of holiday amusements and Scottish presents. 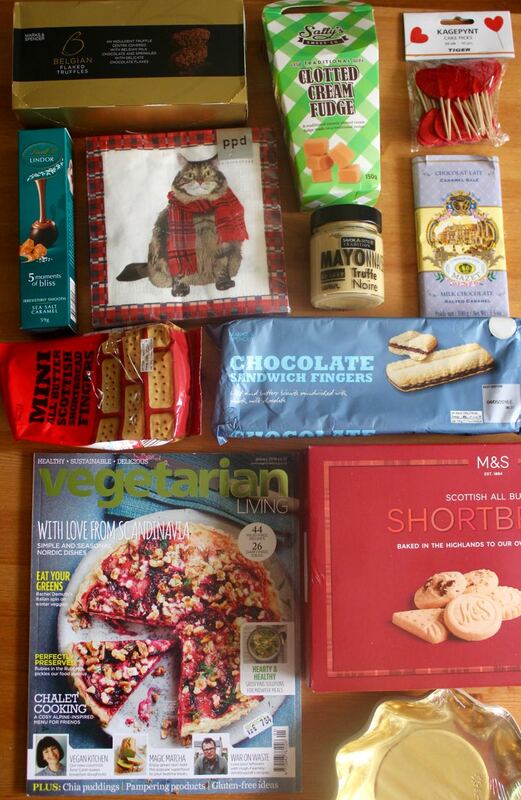 Lots of foodie presents. My mum was in Dublin and Paris before Christmas so we were fortunate to have her doing some Christmas shopping for us in foreign shops. Sylvia was well and truly spoiled. 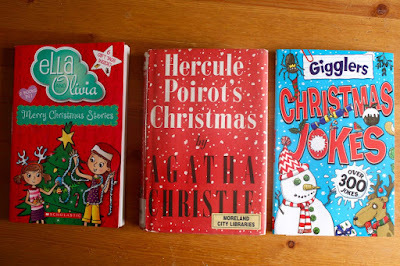 And finally we have been doing some Christmas reading. 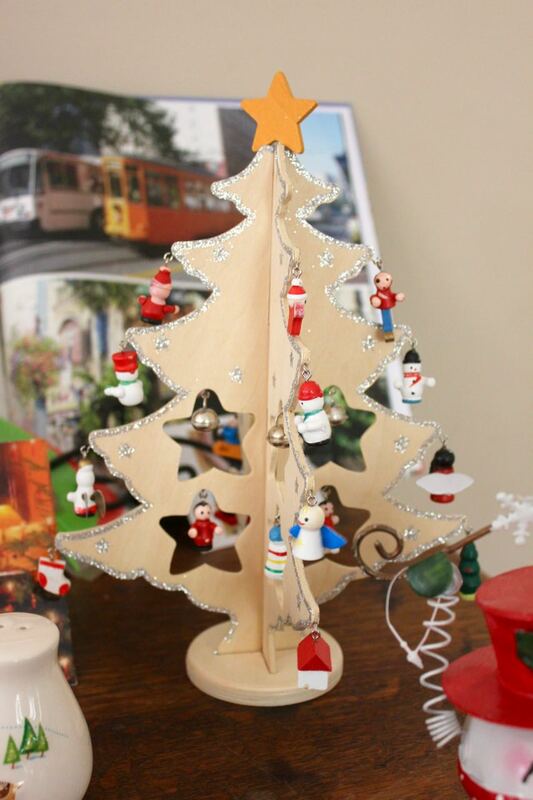 I hope you had a great Christmas and are enjoying the holidays! So it feels like we are well and truly in the home run of Christmas preparations. Here is a little glimpse into our Christmas before I head into a day of baking tomorrow! Locally I have been interested to see that the bins are decorated with festive greetings. 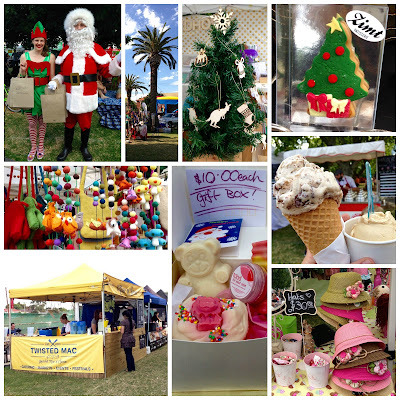 We have also been to Coburg Night Market. 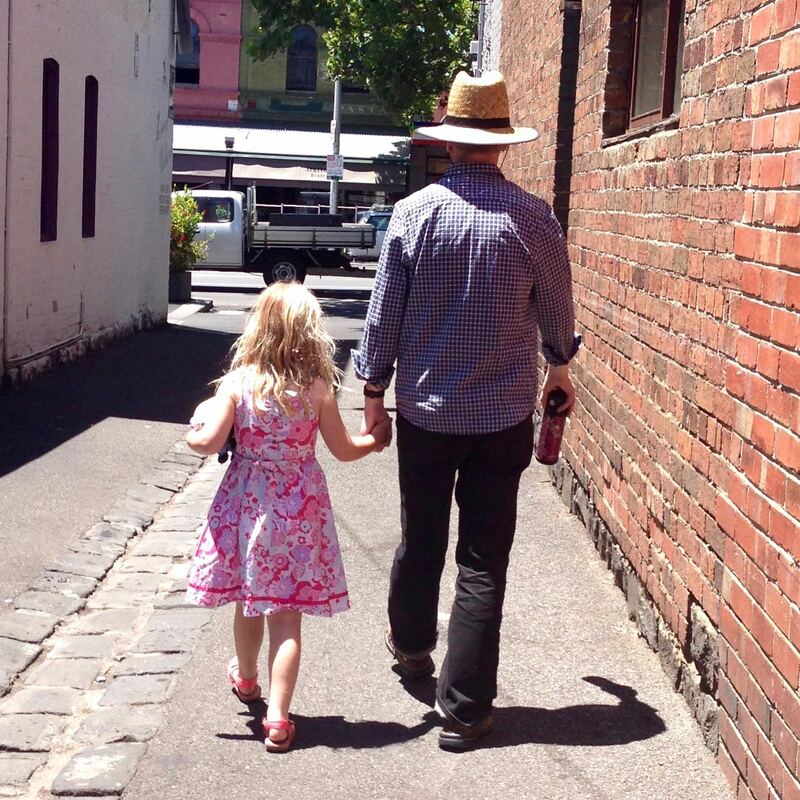 The last day of the market was mercifully cool after 37 C for Sylvia's last day of school. I had Mac and Cheese followed by a Ferrer Rocher ice cream. 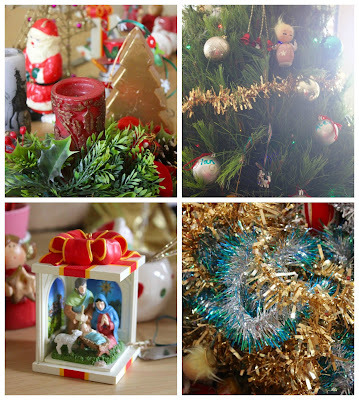 We went to my mum and dad's on Monday to help decorate their tree (see top photo). 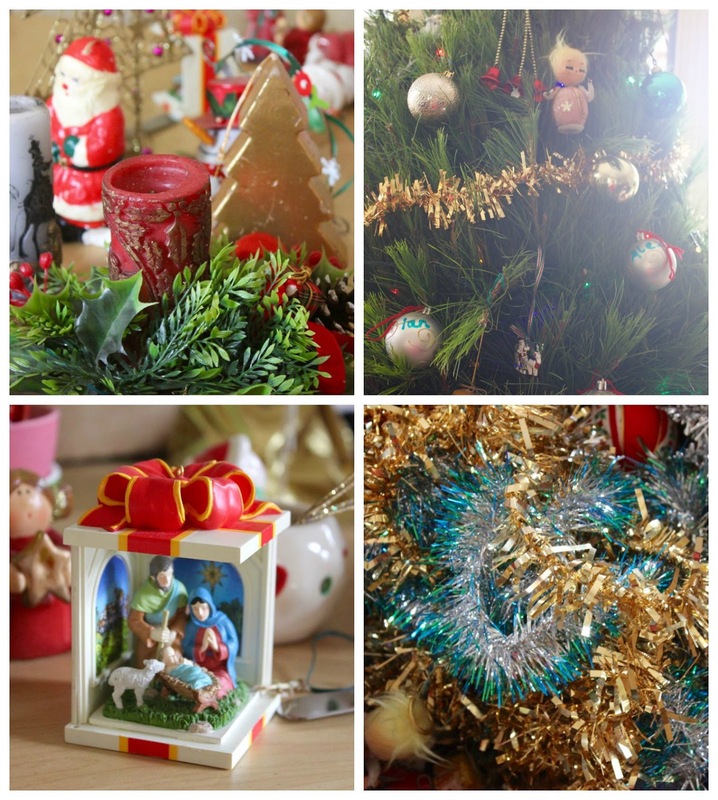 The above top photo is a cute little Christmas tree my mum bought recently. And here are more photos of mum and dad's Christmas decorations. I forgot to take a photo of he decorated tree or my gingerbread house at their place. I have taken a photo of our tree and a few other Christmas sights. Santa at a carols service. Christmas decorations at a vegan buffet at Krishna on Barkly. 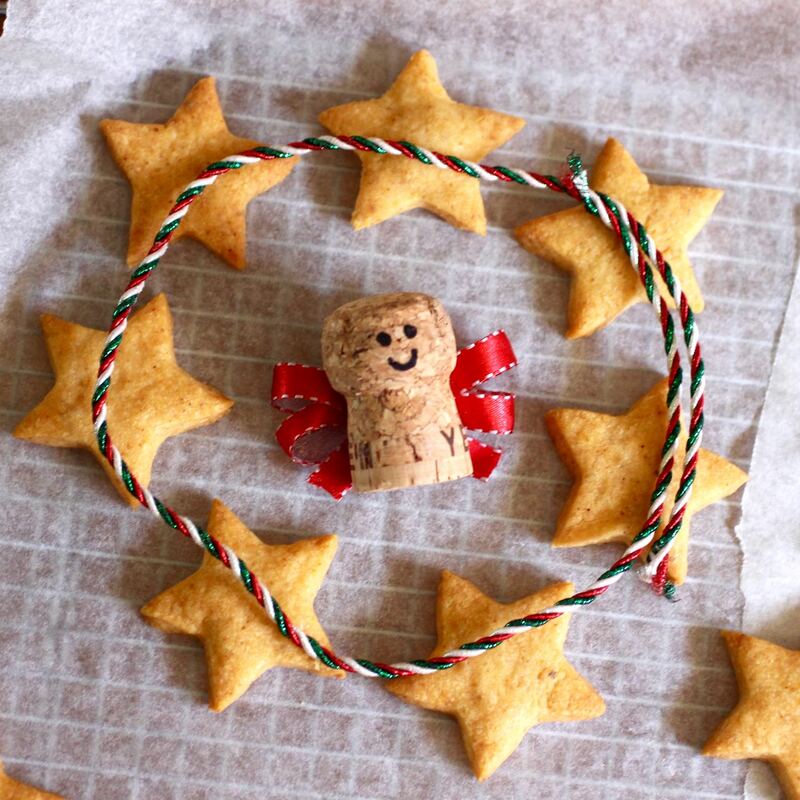 And a little angel made out of a champagne cork. School holidays have begun and Sylvia wanted squeezy bottle pancakes. 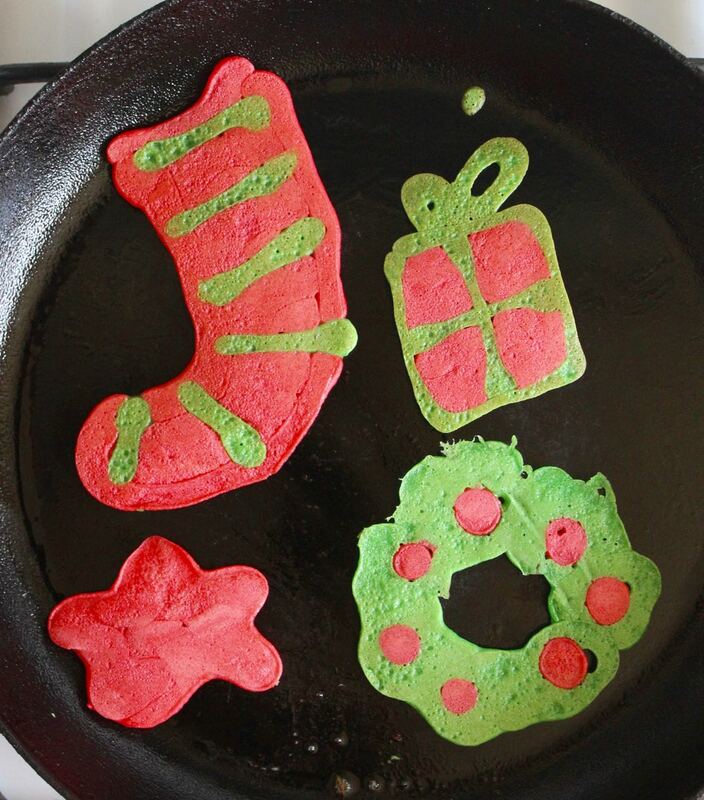 We made these Christmas pancakes yesterday morning before making dips, cheesecake and mince pies. I need to work on my stars! 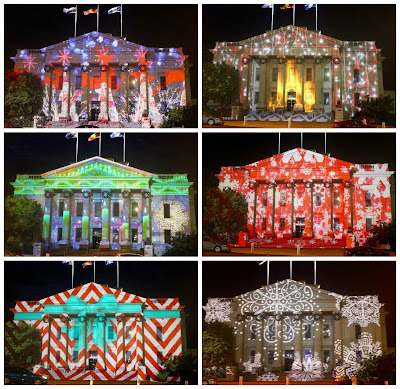 Last night we went driving around Coburg North (above) and Preston (below) to see Christmas lights. 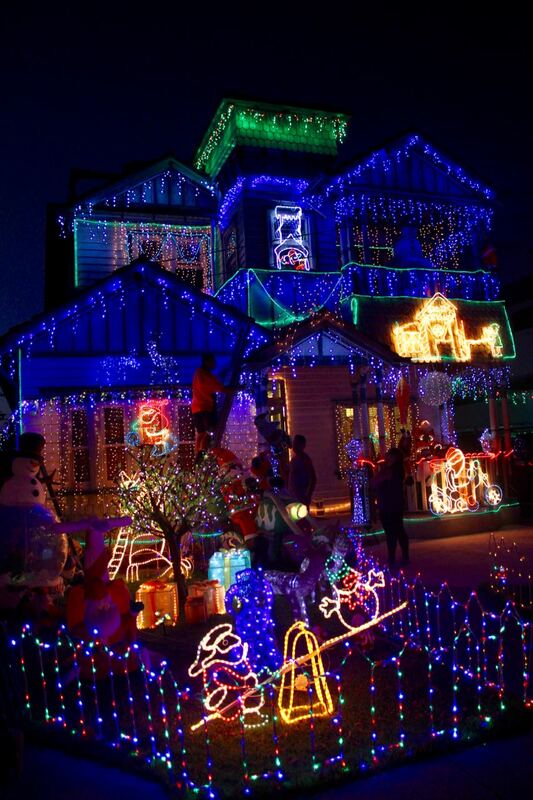 Sylvia just loves seeing them - "the best lights ever" was uttered a few times. It was nice to get out of our local area to see lights featured online though I missed being able to drive around streets I know to find smaller but fun displays. 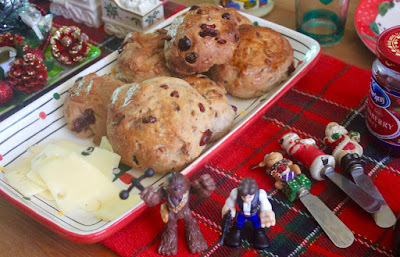 Tomorrow I plan to make nut roast, panforte and cranberry nut rolls, even though it will be 33 C. And deal with the excitment of a 6 year old! 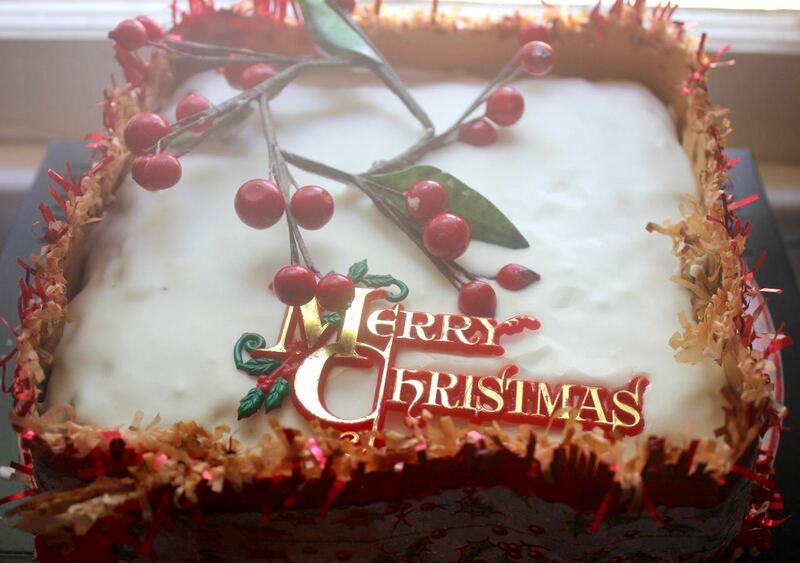 I am looking forward to Christmas Day with my family and will be back here afterwards to share some photos and recipes. I wish you and yours a Merry Christmas and a happy and healthy holiday. 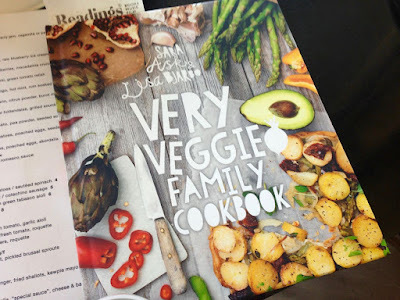 If you have read my blog over the years, you might remember that I grew up eating roast dinners regularly and when I went vegetarian over 20 years ago I discovered nut roasts made a great centre in a roast dinner and ever since I have eaten nut roast every Christmas dinner (with one exception). So I have a particular fondness for nut roasts, especially during the festive season. So it happens that recently I borrowed the Bed and Broccoli cookbook from the library but was too busy to read it and suddenly it was due back and so I quickly skimmed its pages and chose a recipe to try. And I could not resist the simple nut roast recipe. For those who have not heard of Bed and Broccoli, it is a vegan B & B in regional Victoria. 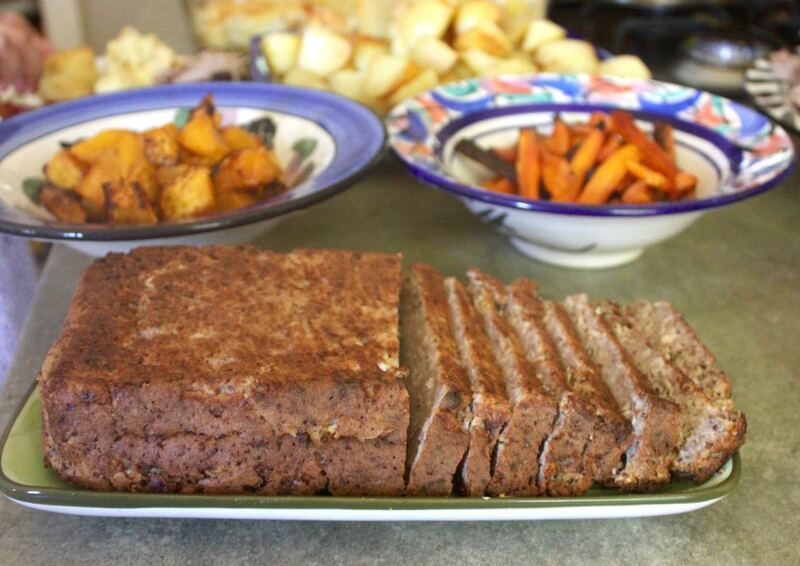 Imagine finding nut roast in regional Victoria! I would swoon! 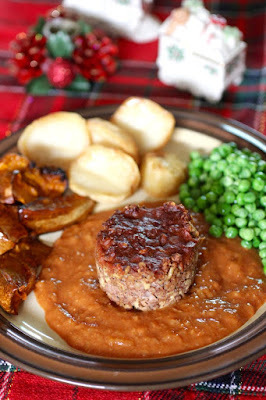 These nut roasts were intended to be baked in small loaf tins and brushed with glaze when hot. One of the problems with nut roasts is that so often they turn to mush if you try to slice them when freshly baked. Similarly these were so soft straight out of the oven they would have collapsed if I had tried to take them out of the cupcake papers to brush with glaze. So I spread it on top like a frosting. 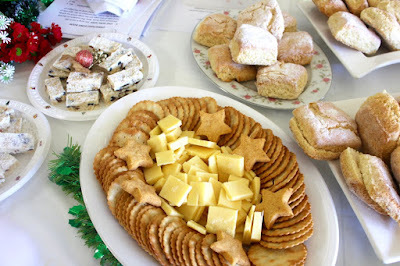 I had intended them to be eaten at a local Carols by Candlelight but it was such a cold night that we decided not to go. (And then a week later it was too hot to go out in the evening, such is our odd weather). Instead I cooked a roast dinner with roast potatoes, roast pumpkin and peas. I made a stupendous gravy with the last of a tomato sauce thrown into the gravy. I found that it was easy to take the nut roasts out of the muffin cup once cold. It was still a bit fragile but if carefully handled it kept its shape. Which made these one of the most attractive nut roasts I have made. My main concern was that I didn't get the flavours of the glaze quite right. Bed and Broccoli didn't call for seasoning but the base needed it and I think the glaze would have been better if I had seasoned it well. However Bed and Broccoli used a BBQ sauce and i just put together an approximation of a BBQ sauce because I don't keep that sort of sauce in my kitchen. The glaze was quite spicy and fruity. Despite my uncertainty about the glaze, I loved these nut roasts when served with the gravy. In fact I could have eaten more nut roast because it was so good. I would highly recommend it to anyone searching for a vegan and gluten free nut roast. Though a decent vegan cheese is pretty important. But these are getting easier and easier to find. Or if you are not vegan, you could just use a good dairy cheese. 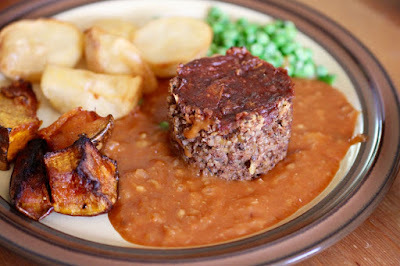 I was pleased to find an article from last year in The Telegraph on A Passionate Defence of the Nut Roast. There have also been some great nut roasts online this year so methinks I am not alone in promoting the humble nut roast at Christmas, whether as part of a traditional roast dinner or a buffet of cold dishes. 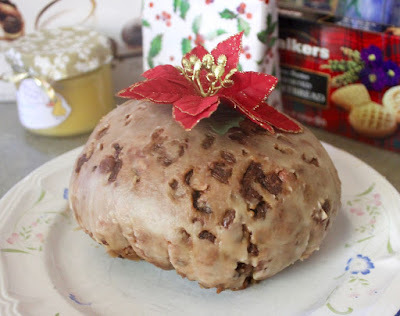 I highly recommend you eat nut roast at Christmas. I always do and could not imagine Christmas without it. (Actually I could because one year in Ireland I was served stirfry vegetables instead of nut roast and I could have cried at how disappointing that Christmas dinner was, though my hosts were very kind people.) So I finish with a simple plea to you. Eat more nut roasts! 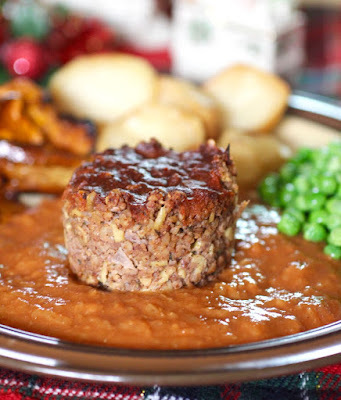 I am sending this nut roast to Jac for Meatless Mondays and Kimmy for Healthy Vegan Fridays. Preheat oven to 200 C. Line a muffin tin with 6 large muffin cups*. 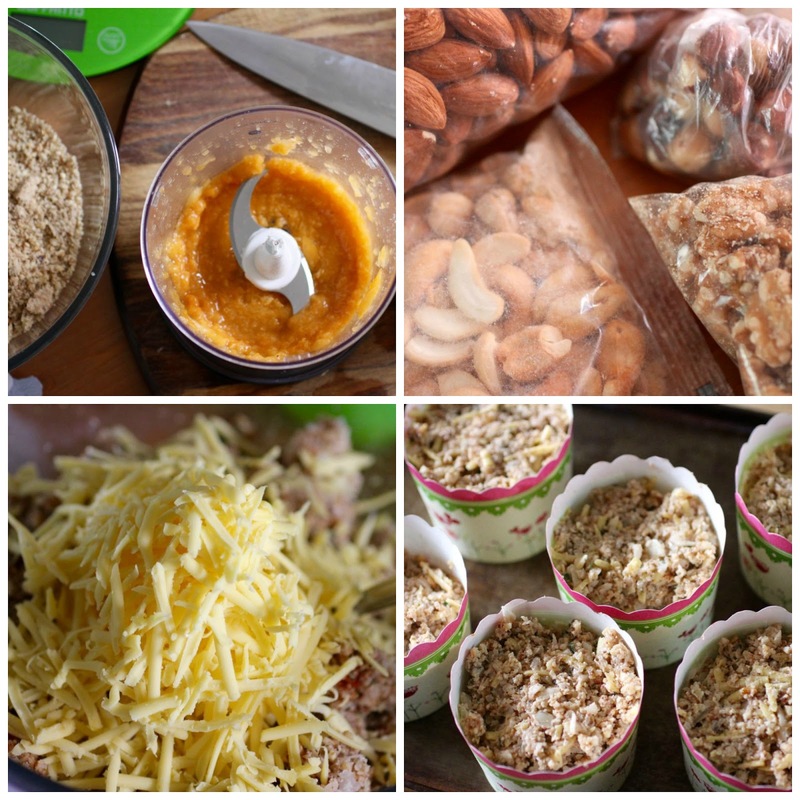 Mix all nut roast ingredients. Spoon between muffin cups. Bake for 20 minutes or until golden brown on top. While nut roasts bake, mix all glaze ingredients together to make a thick sauce. Check and adjust seasoning. Remove from oven and divide the glaze among the nut roasts, spreading it thickly over each on in the muffin cups. Best made the day before, cooled, removed from muffin cups and heated for about 15 minutes on 180 C.
NOTES: I have seen a similar nut roast recipe by Bed and Broccoli that uses tofu instead of apple puree and vegan cheese. For the nuts I used almonds, cashews, walnuts and hazelnuts. For the cheese I used biolife. I think Daiya would work well here too. I used basil as that was what I had on hand but other fresh herbs would do, such as parsley, thyme or chives. For the muffin cups, I used quite large ones because I had them and they did not need to go in a muffin tin as they are very sturdy but if you don't have them muffin cups in a muffin tin are fine. I used home made tomato sauce but a bottled one or a tomato puree would work fine here. 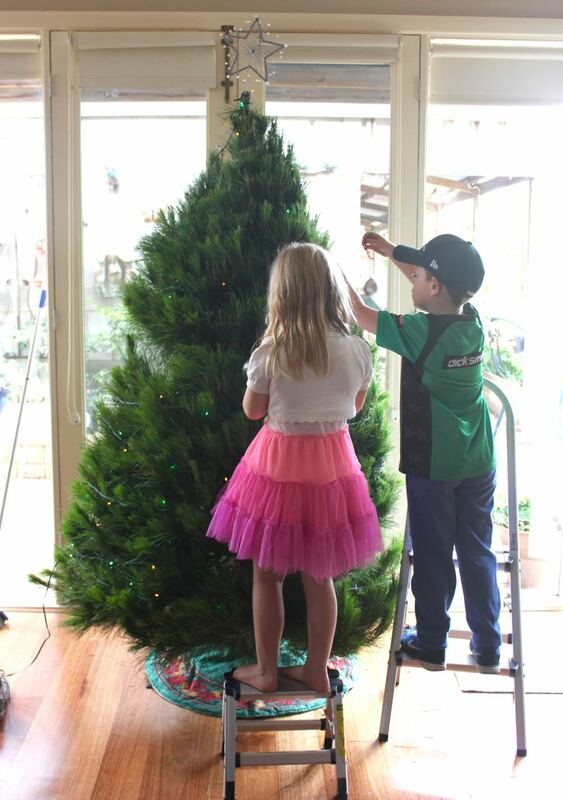 It is beginning to look a lot like Christmas in our place. 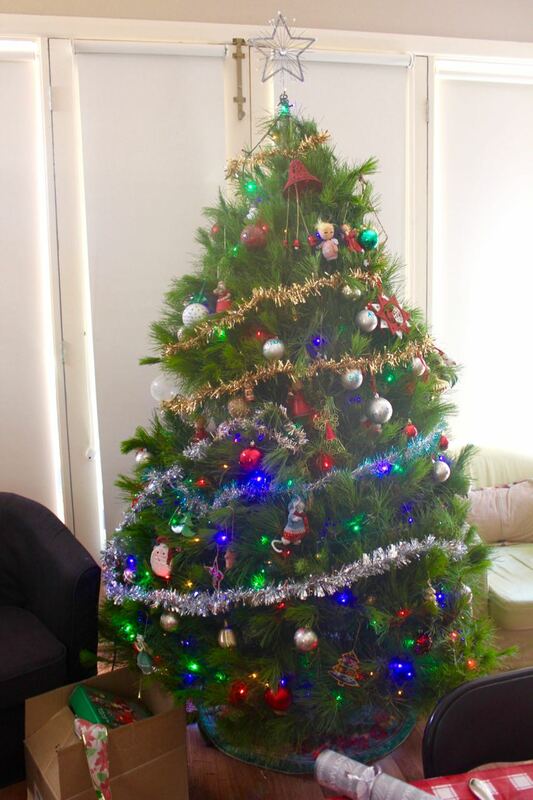 The Christmas tree is up. I have made my first batch of chocolate mince pies. They disappeared quickly. A gingerbread house sits on our kitchen table. We have been eating loads of cherries and drinking Crabbies ginger beer. 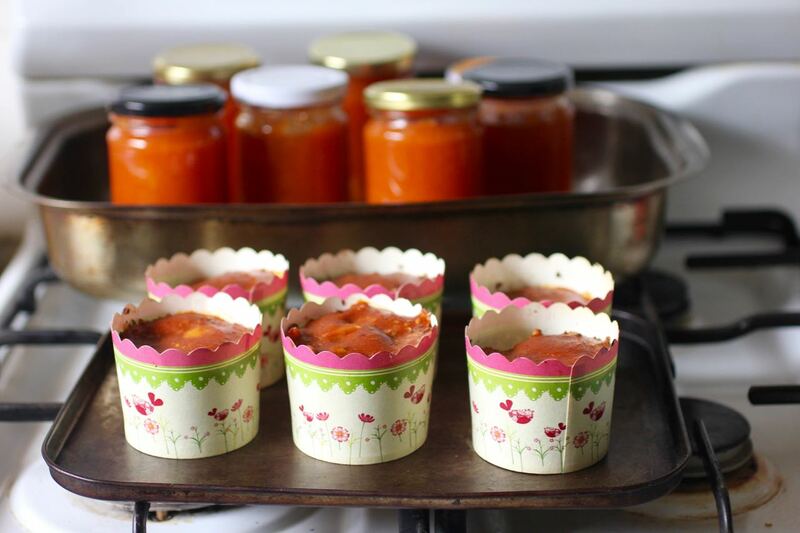 And I have made some gifts in the kitchen. 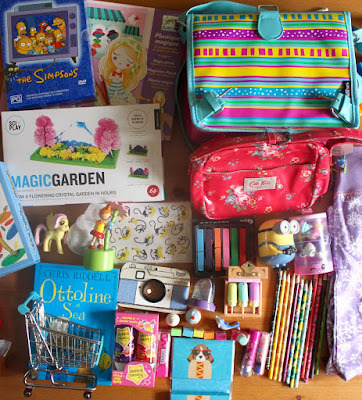 I am inspired by bloggers who make lots of goodies to pack into Christmas boxes to give away. I wish I could say I was one of them. But I only look on in awe. Then occasionally I make a few small offerings. 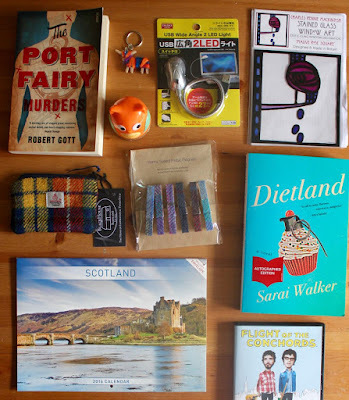 One of the bloggers who makes an amazing amount of gifts is Cakelaw. I have bookmarked a lot of her Christmas recipes. I was volunteering at a Christmas lunch the other day and wanted to bring a plate along. Time was tight. It had to be quick. 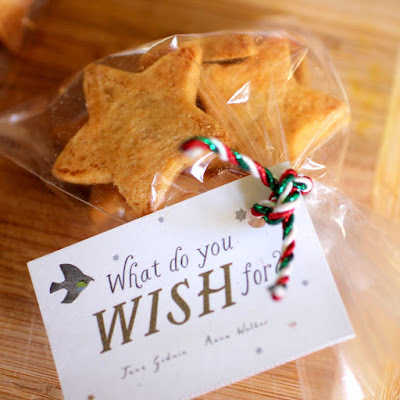 I stumbled across these cheese and walnut shortbreads in my bookmarks. They were quick and easy. And tasted great. Crisp, cheesey and melt in the mouth sort of shortbread. They are quite different to Nigella's cheese stars (like these) that I love but are best in the first day or two and less buttery. Most of them were eaten by the volunteers in our lunch before the guests arrived. When I said I had made them someone said that they had thought they were biscuits from a packet. They hastened to add that this was meant in the nicest of ways. 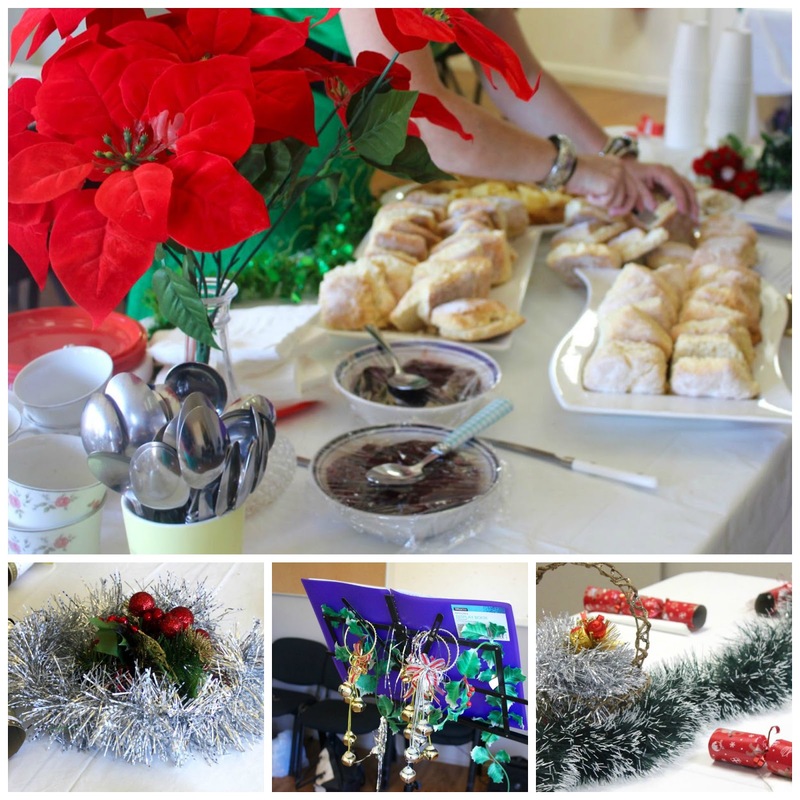 The party was after lunch so we served scones with jam and cream, Christmas pudding, white Christmas and crackers with cheese. We chatted to the guests and sang carols. Santa arrived at the end and gave everyone presents. 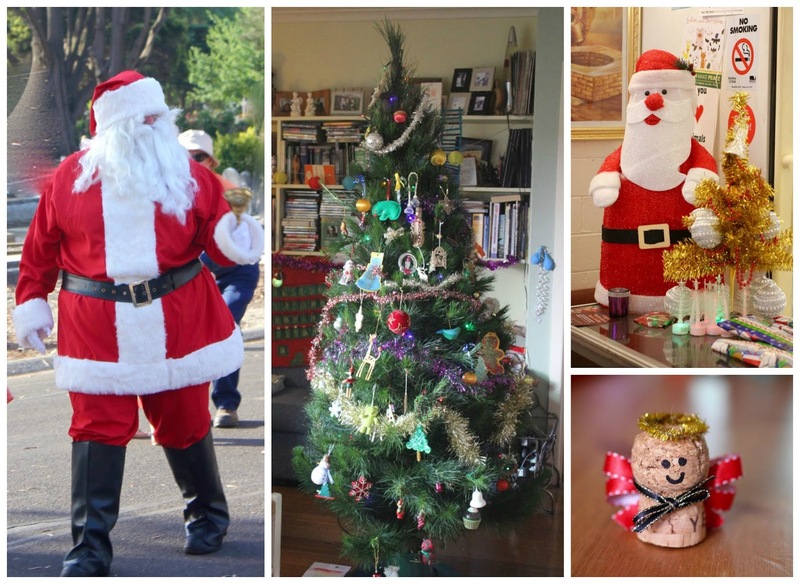 It was all very jolly and festive. More importantly, it was great to be able to involved in a local community event. I had only had time to use half the dough and pulled out the other half the next day. I wanted to make something for Sylvia's teachers. Savoury seemed a good option in this time when we have so many sweets. Sylvia enjoyed helping make the second batch of shortbreads. In the above photos I put my little champagne cork angel when it was work in progress. I later glued on a glittery gold pipe cleaner halo and a ribbon around the neck. It was then returned to the friend who had brought over a bottle of champagne. 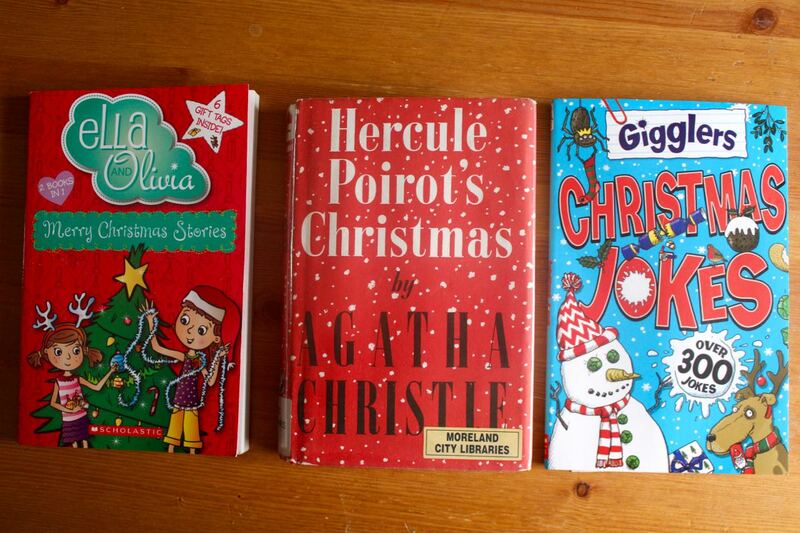 Another part of our Christmas is the picture books that we only bring out at this time of year. 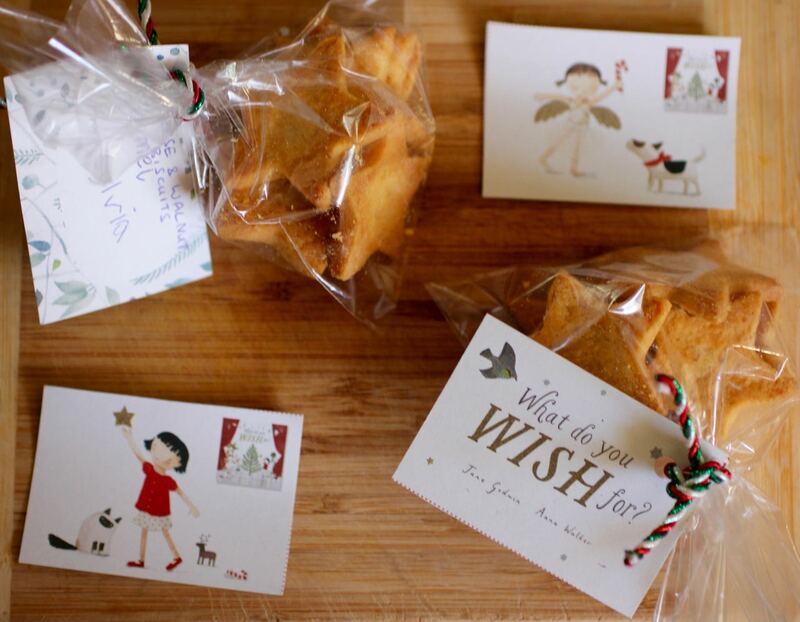 This year I bought a new one called What do you Wish for? by Jane Godwin with beautiful illustrations by Anna Walker. Every time I read it, the hair stands up on the back of my neck because it is so sweet. I was given some gift tags when I bought it. They finished off the packs of shortbread stars nicely for teacher gifts. I was glad I baked them a few days ago before our heat wave began. 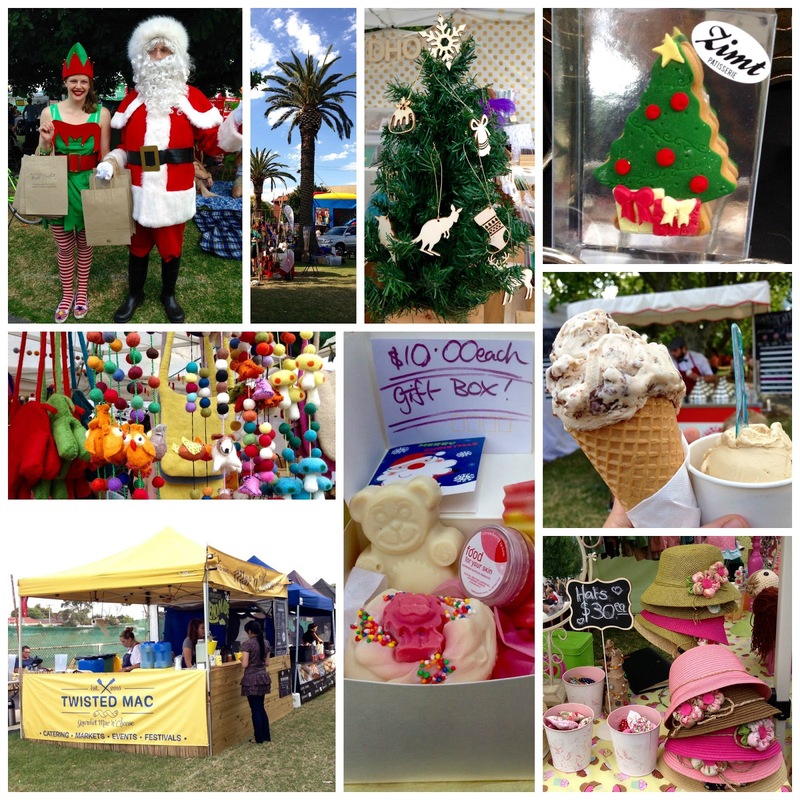 Ironically, last weekend we decided not to go to an outdoor carols service because it was too cold (19 C) and today we have cancelled a trip to the Fitzroy Market and Moonlight because it was too hot (41 C). Thank goodness for the pool! Hopefully we will get some cooler weather before Christmas to bake more mince pies and maybe even more of these cheese and walnut shortbreads. I am sending these to Caroline (and Ros) for Alphabakes (N for Nuts). Mix the flour, smoked paprika and salt in the food processor. Add butter, cheeses and walnuts. Process until it forms a ball of dough. Briefly knead on a lightly floured surface until you have a smooth ball. At this stage it is best to wrap in clingfilm and refridgerate for at least an hour. I halved the dough and used half straight away which was fine and left the other half in the fridge for a day. Preheat oven to 180 C and line a few oven trays with baking paper. 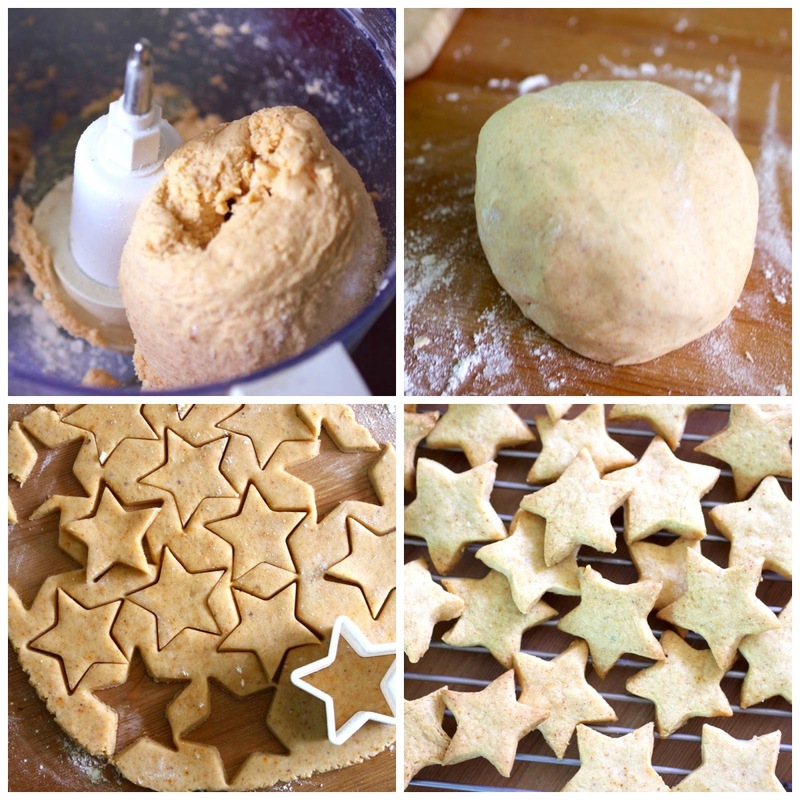 Roll out half of the dough on a lightly floured surface until it is about 2-3mm thick. Cut into stars or the shapes you desire. Transfer to prepared oven trays leaving about 1-2cm between each shape. Repeat with any leftover scraps of dough then continue to cut out shapes with second half of dough.